When I was recently offered to come and have an Ole Henriksen Radiance facial at Harvey Nichols I gratefully accepted the kind offer-a girl needs sunshine in the summer that feels more like autumn-but volunteered to review it because when it comes to Ole, his approach to life deserve to be shared. Imagine Harvey Nichols in the grip of sale mania, with men and women alike dashing around, looking for bargains. Imagine also me, serenely gliding through the crowd with an only aim-to enjoy the facial, which took place at the back of the Beauty Hall, in a small yet cosy room that welcomed me with bright orange colours-towels, oranges, candles. My beauty therapist on the day was the wonderful Claire, whose Irish lull almost instantly put me in a cosy cocoon. I have had the pleasure of having a mini facial with Claire in the past, so knew that I was in safe and knowledgeable hands. Claire quickly went over how my skin felt in general and let me get cosy on the treatment bed in privacy. The whole ethos of Ole Henriksen is built around the natural beauty of the skin and enhancing it, as well as nourishing it appropriately, while indulging your senses visually and sensually. The facial started with the African Red Tea Foaming Cleanser-applied with Ole’s orange sponge that looks like a flat paper disk when unpackaged, before you put it into water and it magically transforms into a bouncy cleansing sponge. The cleanser contains vitamin C, borage oil and African red tea that make this product gentle even for the sensitive skin but effective enough to clear away make-up from your face. Claire then proceeded to generously mist my face with the Pick Me Up Mist that feels like water dew on your skin. It is an active product that rejuvenates the skin but for Claire it’s also a so called ‘red flag product’ as it tests the skin and let’s the therapist know if the customer indeed has sensitive skin, so the facial can be tailored with the rightly chosen products to suit your skin type. She also misted my face with the African Red Tea Mist that contains orange, tangerine and mandarin extracts that help to purify and brighten your skin, as well as act as an anti-septic. With my skin as clean as can be Claire examined my face and made me blush with compliments, saying that I have a perfect skin tone, including on my neck line ( ‘a six year could be jealous of it’ ), small pores, my skin is well-hydrated and she stated, rather than asked that I am not a smoker-true, absolutely true. Smokers tend to have a grey skin tone and lines around their mouth, as well as crow’s feet around the eyes that a good therapist notices straight away-so beware, your secrets will come out when you come to have a facial! Post diagnosis, Claire proceeded to apply Blue/Black berry enzyme mask that is deeply hydrating, as well as renewing. Blueberry and blackberry help to refine your skin texture, while papaya enzyme removes dead skin cells and lavender calms your senses, as well as your skin. Claire also brushed a chamomile mask around the apples of my cheeks to calm and sooth the skin. Last time I was in this treatment room the massage table was in the middle of the room but on this occasion it stood next to the wall, which made me laugh and state that clients must end feeling so relaxed they fall off the bed during the treatments. Claire then proceeded to give me the most relaxing ( yet nicely firm ) hand and arm massage. She stretched and relaxed every finger, worked on the neck line and shoulders and later told me that as I tend to gather tension in my upper body due to computer use, so it would be beneficial to do simple neck rolls and hunch shoulders intentionally up and down a few times in the course of the day, to make sure that my body doesn’t turn into a ball of tension. The massage and the music were so soothing I almost fell asleep-luckily for me some stomping was going on next door-an elephant was jumping for joy at the variety of beauty products ? !-but I was so relaxed I could hardly giggle, let alone be bothered by the commotion. Ole Henriksen Ultimate Eye lift gel was then applied to my eyes-always follow the orbital bone and never ever apply your eye cream on gel on the eye lids and under the eye, if you don’t want to end up with eye bags-thank you Claire, the tip duly noted! What followed was a wonderfully nurturing face, shoulder and neck massage where my facial and neck muscles were stimulated and toned. You relax and let go completely, just enjoying the facial massage as your mind empties of any thoughts voluntarily. Claire then gently wiped my face, making sure there was no residue and applied the serum and the Sheer Transformation cream ( this oil free cream is light in texture, yet it penetrates deeper into the skin and helps to fight discolorations, sun spots and provides free radical protection thus slowing down the ageing process ), followed by Protect The Truth Vitamin C SPF 50+ sunscreen , as well as the SPF 50 eye cream. As I gently sat up, she gave me a glass of the freshly squeezed apple juice-a truly decadent, girly indulgence in the middle of a very busy shopping emporium. I left Harvey Nichols with plump and even skin tone and even a few days later my skin feels more toned and perfectly balanced, without me doing anything extra. Add to that useful skincare and massage tips from the wonderful therapist that are easily incorporated into your daily routine and you are set to to look your best on a daily basis. 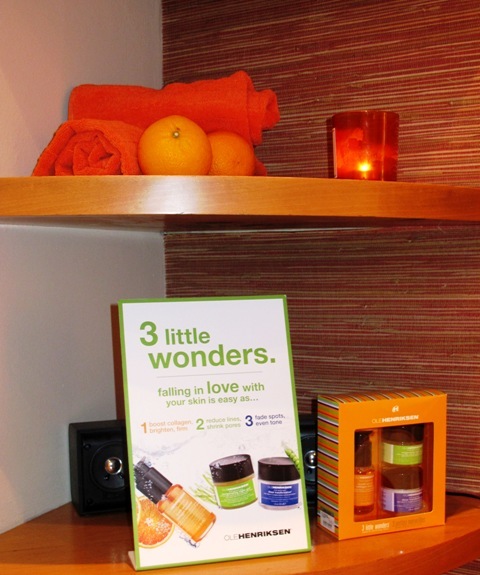 Ole Henriksen Radiance Facial is 50 minutes long and next time they will take place in September.